Is anyone else out there prepping for the holidays and doesn’t want the same old thing?!? I am hosting Thanksgiving this year and decided to switch up a few things. 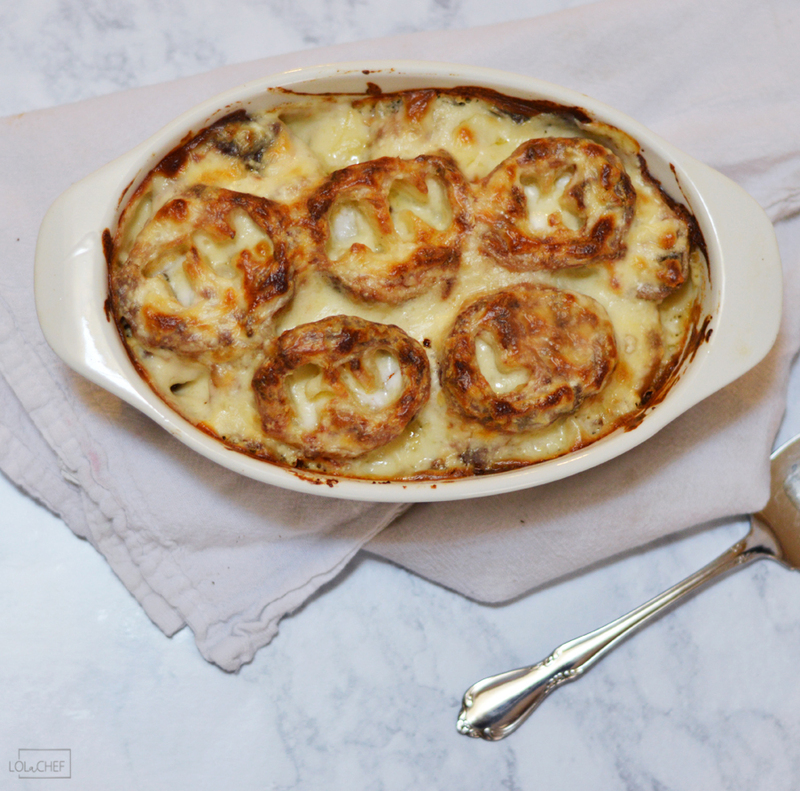 Since I already have mashed potatoes on the way, I decided to offer an alternate potato dish…this one with a kick. Most of my guests have volunteered to bring the basics. This leaves me room to play around 🙂 Why not kick it up a notch with some spicy jalapenos?!? This all started with Hairbie’s refusal to eat scalloped potatoes. He insisted that he has always hated them…..challenge accepted! I knew I could make him like them as much as I do! He loves pepper flavor and spicy foods so it seemed natural to use pepper jack cheese and add some jalapenos. In the past, I made jalapeno poppers and received a great response from friends. A trick I tried was slicing the jalapenos in half, removing the seeds and most of the inside membrane. Place them in very cold ice water for about 30 minutes. This takes the heat intensity down a few notches to tolerable (for me anyway). What you are left with is pepper flavor with a hint of heat. I also used shallots in place of onions for a bit of sweetness to balance with the heat. Another trick with this recipe is one that you can skip if you like. I used the same method with the potatoes that I use for making baked french fries. 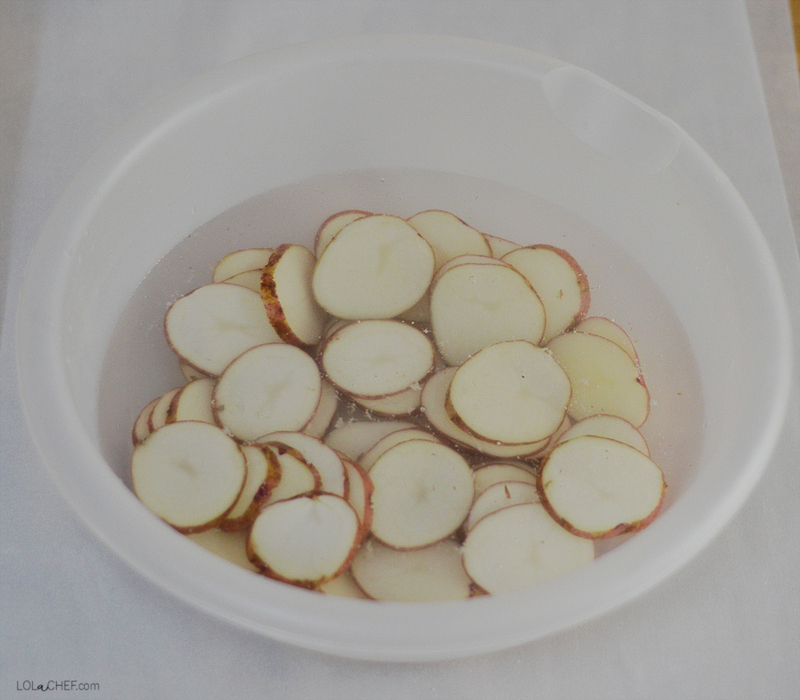 You slice the potatoes, then soak in water for about an hour. This releases some of the starches so they will crisp up better. For this recipe, I sliced them, then stuck them in water for 1 hr. Then I took them out and dried them thoroughly before adding to the casserole dish. The sauce for this recipe is fairly easy. I simply melted the butter with the shallots added some flour and whisked then cooked for a few minutes. Then added milk, pepper jack cheese, white cheddar and a small amount of cream cheese in a saucepan until melted smooth. 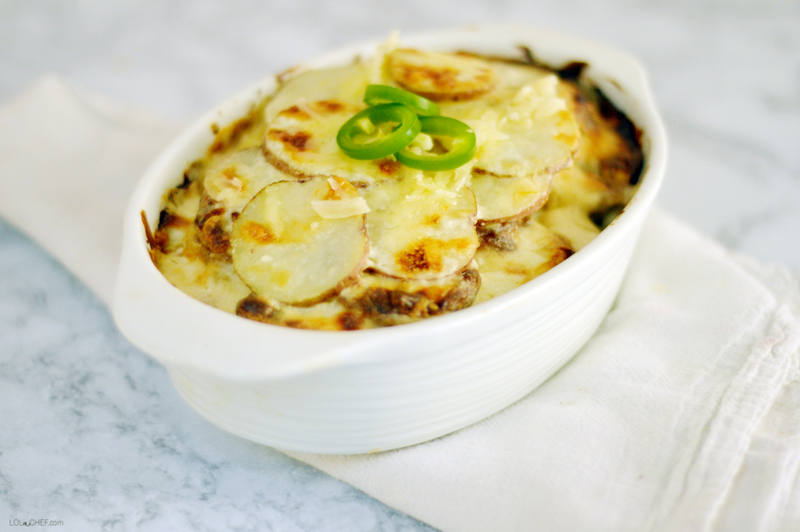 Layer the potatoes and then add all to a shallow casserole dish. Or, take your time and play around like I did making mine more festive for Thanksgiving. So, I MADE Hairbie try them. I told him he only had to take one bite and not to worry I was going to bring the rest with me to coffee with friends the next morning. Since he made such a big stink that he hated scalloped potatoes, he didn’t comment on the potatoes. After devouring all the potatoes on his plate and claimed the rest for himself…..hmmm. Challenge complete I won! *this post contains affiliate links for products I reccomend, all opinions are my own.